Click the button below to add the FLASH TIME! Boys Gymnastics Leotard/Unitard: Red, Yellow - FREE SHIPPING! to your wish list. 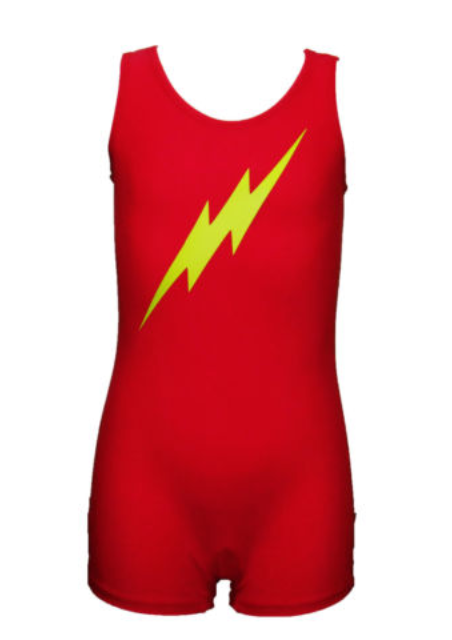 The new Flash Time boys gymnastics unitard is here! The striking red unitard is visually stunning. Dazzling lightning bolt emblazoned across the front will turn heads at the gym and on the podium. This statement-making gymnastics unitard is designed to meet the highest quality and performance standards. Each unitard provides exceptional comfort and durability. Every genuine Flash Time gymnastics unitard is hand-stitched in the USA featuring rich craftsmanship and precision detailing. Each unitard is made from the lightest, highest-quality nylon spandex 4-way stretch material. This material can be stretched repeatedly while maintaining most of its original size and shape. The eye-catching design of this stunning unitard will give every super gymnast an unbeatable combination of confidence, comfort and pride. Perfect for special gymnastics shows, camps and theme days. Also makes a great gift. Order your Flash Time gymnastics unitard today!